Skiers and snowboarders enjoyed the fresh snow that fell throughout the week at Arapahoe Basin Ski Area Saturday. Music emanated from speakers throughout the mountain base. Flags flapped in the wind and barbecue smells wafted through the air. Many ski enthusiasts wore fun colors and costumes, and Smokey Bear gave out high fives and hugs. Saturday was the ski area’s Save Our Snow event. Each ticket holder got a $10 discount, and $20 of each ticket sale was donated to the High Country Conservation Center. “This is a great fundraiser and a great promotional event, and it’s our fifth annual so we are hoping to keep it going for lots of years beyond today,” said Cassidy Callahan, A-Basin’s environmental coordinator. “We also wanted to share what we are doing in our sustainability programs with our guests, and we have a lot of partners in the community who are sustainability-minded,” said Sha Miklas, A-Basin’s guest services and environmental manager. “We wanted to give them an opportunity to share what they are doing,” she said. At the base of the mountain, in a “green village,” mountain employees sold raffles, and representatives from a handful of different local companies and nonprofits shared their sustainability initiatives with guests. Matt Gonzalez came to the event to promote the ski-oriented carpooling website Alpine Source. At a nearby booth, representatives from forest groups took the opportunity to educate guests about different areas of environmental education. “A-Basin has a longstanding commitment to sustainability,” said Jessica Evett, the executive director of Friends of Dillon Ranger District. “The ski areas in general in Summit County do support groups like ours to connect with guests and get the word out about what we do at a local level, which I think is really critical,” she said. 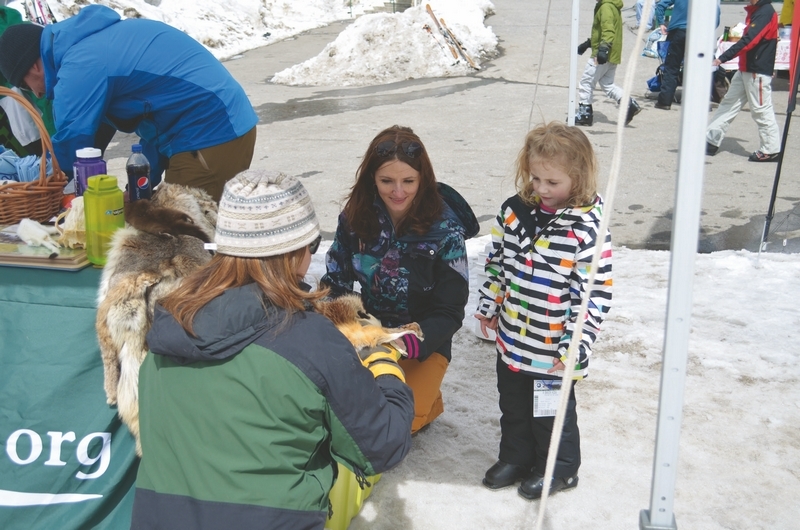 Kristin Adkins, of Wheat Ridge, took a break from skiing to take her 4-year-old daughter Harper to a booth learn about local wildlife and to touch animal furs. “She is fascinated by wildlife and I want to expose her to as much Colorado wildlife at an early age,” Adkins said. The ski enthusiast said she enjoyed the opportunity to mix recreation with environmental education. “This is what makes Colorado so special and especially Arapahoe Basin. It’s a gem in terms of Summit County ski areas because of things like this. It is accessible and very family friendly,” Adkins said. A-Basin employees used the opportunity to share their sustainability initiatives with guests at the event. The ski area has a waste-reduction program that involves composting and recycling, and it offers sustainability guidelines for its staff so employees can make environmentally friendly choices. At Saturday’s event, volunteers informed guests what can be composted and recycled. “By offering those different streams for our waste to go, it limits how much waste goes into the landfill,” Callahan said. The biggest impact Saturday’s event will have on the future of sustainability is through the funds raised for High Country Conservation Center, event organizers said. Both Miklas and Callahan have been personally impacted by HC3’s work. “The conservation center is what got me into sustainability. I started volunteering for them years ago and they are very inspirational,” Miklas said. Today, she serves on their board of directors. The two said they were thankful that A-Basin’s upper management was willing to host Saturday’s sustainability event.